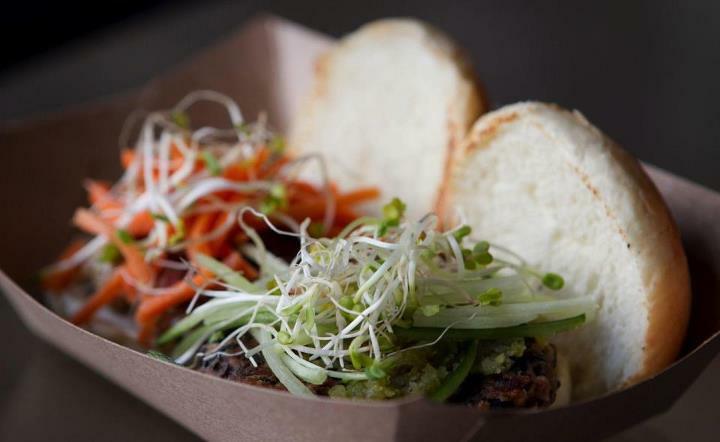 Opening a couple years ago in St. Paul, Gastrotruck really brings the upscale and complete Environmentally Responsible attitude to Food Trucks, while still maintaining the Street Food idea. My first taste of them was during a blistering 2011 Summer; my first actual time hauling myself all the way over to St. Paul (didn’t have car access at the time) to get in as many of their Food Trucks as I could. 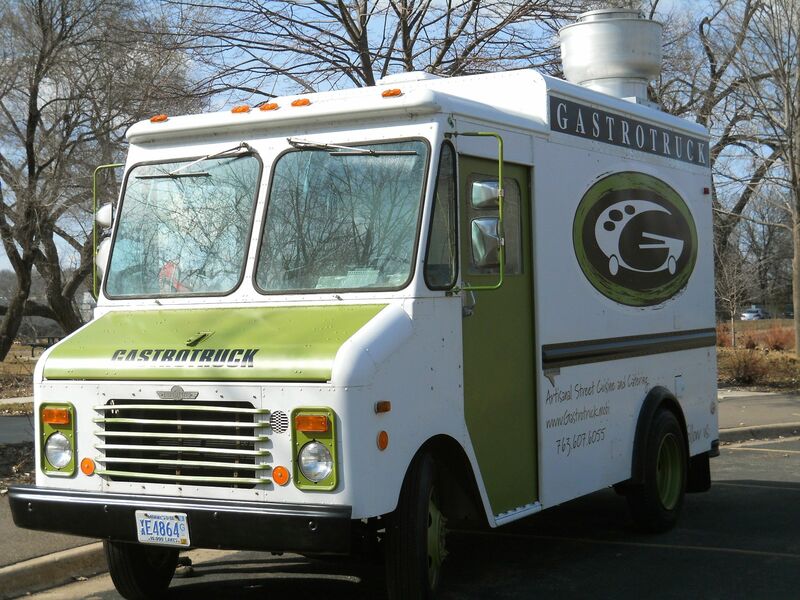 I was so excited when I saw this thing called “Gastrotruck,” then seeing all their fun menu items. Then I practically screamed hallelujah when I saw their line-up of Dry sodas (and that’s the brand name, not just the style)… then again I was also really thirsty and kept thinking about the last time I swam in cold water. Now, from my understanding of things, there has been a little change in menu style along the times. Gastro started off doing mostly sliders, with only a bare few non-slider options, which is what I had on my visit. Last time I visited, and from what I’ve read and seen, their focus has changed onto larger, single sandwiches, with one or two slider and other options. Working for twenty years in the industry, in multiple countries and multiple quality restaurants, Chef Stephen Trojan places a high focus on pure kitchen preparation. All meats are butchered and prepped with detail, every scrap of product is used to 100% capability, and every single condiment they make is from scratch (any truck, any restaurant, anyWHERE you can find a handmade ketchup and/or mustard, you go there, and you use them). Anything made by somebody else is local and quality. Menu items change often depending on what they can get. As it has been a while since I’ve seen them (and their being in St. Paul, away from my Minneapolis focus), I don’t have a handle on what items remain more constant. I would certainly say, though, that their Pork Belly sandwich is likely to be on most of the time, and thank the god of swine for that. The buns on all sandwiches I have had here have been grilled and toasted to crispy goodness. All their fillings are cooked as well as one would expect from such a seasoned, upscale Chef and Kitchen as this. 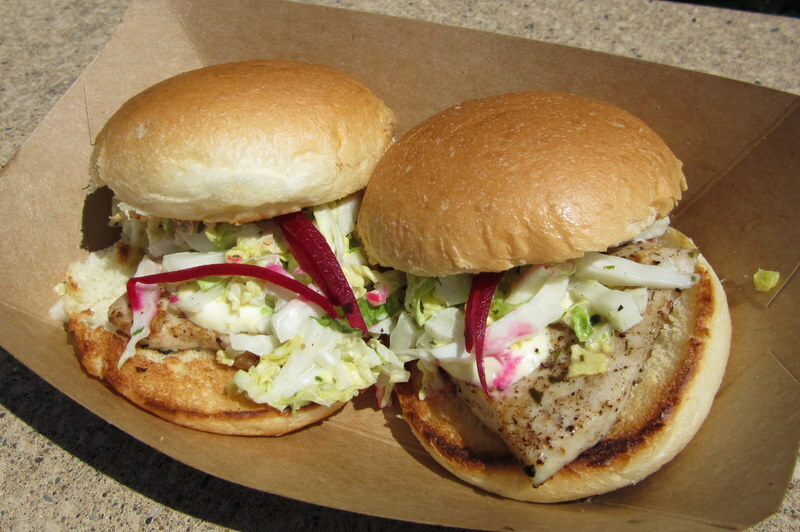 Swordfish was the slider I got, topped with this perfect raw vegetable slaw and Asian sauce. Pork Belly is Pork Belly, only the truly skilled can F&@% it up, and the experienced chef can make it taste like fatty heaven. You will not regret a sandwich like that. I would give this a higher score, but during the visit I shared with my cousin, we got this “Philly Cheesesteak”-spun sandwich that was just… okay. It tasted good, and cheesy, but wasn’t at that proper upscaled-yet-sinful level as other menu items. The cheese just tasted… overproduced, mass-market, like it had velveeta or something in it. So one SHOULD be a touch cautious of different options, though the chance is still high you’ll pick something fantastic. The sandwiches can be a bit messy. I remember even the sliders would have benefitted from two hands; at least, the ones with messy toppings (there are probably some simpler ones out there). Walkability becomes a bit shaky then, but usually not a big issue. One always has to sacrifice with quality-done, handmade products done to an extent such as this. 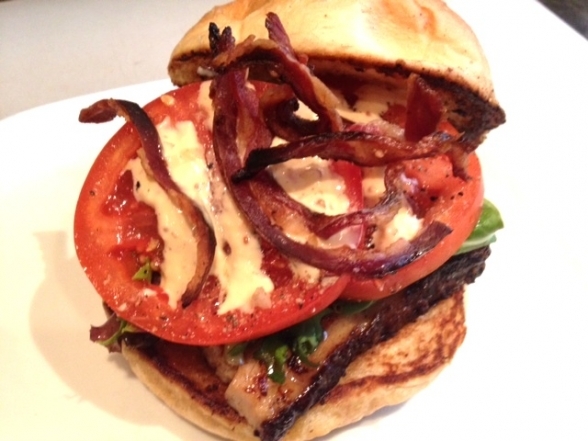 Prices usually stay around the uppers of 9, with 7 for smaller dishes like sliders. It is certainly worth it, however, and thankfully they never get even near the obscene Smack Shack and Sushi Fix averages. Good speed, don’t need to wait too much, a sign of experienced chefs in the kitchen. I’ll have to go back and see them again to get a FULL feel, as the last visit was during the gigantic chaos of the new Food Truck Fair. In my experience of studying and tasting many of these trucks, I have found it is very difficult to focus on the Upscale-Restaurant, created by High-End Chef sort of experience while maintain the many “TOE” essences. Upon discovering Gastrotruck, however, I found that it somehow did exactly that; it felt like a true, dug in Food Truck, just done differently. Maybe it’s the name, maybe it’s the design, or maybe it’s just the experience of the chef, but it has a little something to it, and I am so happy about that. … at the end of the day though, as you see, I had to take off points because of a certain something. I wanted this to score higher, I planned on scoring them higher, but there’s something that I just can’t shake. I want them to go back to Sliders. I want their menu to go back to just doing different fun, quality focused sliders ALL the time (with the one or two different things). It creates that “Focused Theme” idea that helps you decide where you want to eat; they’re almost Toe Ring-like in their nostalgic-specialty. Right now, they really need to be separated from the “Generic Variety” menus of other Upscale-focused trucks like Fork in the Road and 128. Pulling their focus back to quality Sliders can really give them that fun distinction and uniqueness that can once again catapult to the top of the Pillar, as another example of a different kind of Truck. Until they do, I shall be waiting here, very patiently, for the successful return of one of my favorite wheeled restaurants. Hard to put a solid suggestion into such a changing truck menu as this. What I can say is they always do sliders well, and those will most likely always be on their cheaper side, so a great first thing to have. Their Pork Belly items are always a standout, you will never regret buying one (unless you’re vegetarian… but then this wouldn’t make any sense). Much like my review of Sushi Fix, , I believe for us to make a stand and wait until they start placing their menu focus purely on Sliders once more. They are such an important, integral member of our Food Truck family as is; with the focus on Sliders, Gastrotruck can become one of our most important member to date. This entry was tagged Food, Food Truck, Homemade, Minnesota, Pickles, Sandwiches, St. Paul, Street Food. Bookmark the permalink.